Dr. Mary Matthews enjoys a varied musical life as a soloist, chamber and orchestral musician, lecturer, and clinician. She has appeared as a soloist with the Hartford Independent Chamber Orchestra, Firelands Symphony, Pottstown Symphony, and Baldwin Wallace Symphony, and tours internationally as a member of the Soundscape Trio and Cuatro Puntos. In 2013, she was appointed principal flutist of the Hartford Independent Chamber Orchestra, and she performs regularly as a member of the Generous New Music Ensemble. Notable performances include a debut season at the acclaimed Newport Music Festival, the 2013, 2012, and 2011 National Flute Association Conventions, the Goethe Institut Música Nueva Festival, and the Jornadas de Música Contemporánea in Cochabamba, Bolivia. 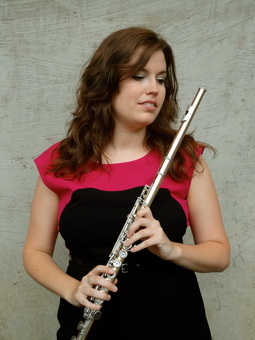 Dr. Matthews has won numerous competitions including the 2012 South Carolina Flute Society Young Artist, 2010 Kathryn E. MacPhail Young Artist, 2008 Firelands Symphony Orchestra Young Artist, and the 2008 Baldwin-Wallace Concerto Competition. She received an Honorable Mention in the 2010 Mary Graham Lasley Young Artist Competition and was a finalist in the 2010 Coeur D'Alene Young Artist Competition, the 2009 William C. Byrd Young Artist Competition and the 2009 JC Arriaga Chamber Music Competition. Over the course of her career, she has been selected for nine musical performance and outreach grants. A dedicated pedagogue, Dr. Matthews is adjunct faculty, past director of the collegiate flute choir, and co-instructor of flute technique methods at The Hartt School. She maintains a full studio in The Hartt School Community Division, where she also heads the Suzuki Flute program and coordinates the adult chamber music program. In the past, Dr. Matthews has been on faculty at the International School of Music in Bethesda, MD and the Royal Arts Academy in Olney, MD. She has presented flute masterclasses at Baldwin Wallace Conservatory of Music, Orquesta Sinfonica de Tarija, Instituto Eduardo Laredo, The Hartt School Community Division, and The Dahlia Flute Duo Summer Masterclass. She is also a registered Book One and Two Suzuki Flute Instructor. As a specialist in the fields of Musical Entrepreneurship and the Flute Music of Women Composers, Dr. Matthews has been invited to speak at The Peabody Institute Career Development Series, the College Music Society National Conference, the Women Composers Festival of Hartford, the congress of the International Alliance for Women in Music, The Hartt School Music and Performing Arts Management Department, and the Rochester Flute Association Annual Conference, among others. Her doctoral thesis is titled "The Flute Music of Anna Bon di Venezia in the Context of Eighteenth-Century Flute Repertoire" and provides a theoretical, historical, and pedagogical analysis of the composer's compositions for flute. She began her formal flute studies in the Eastman Preparatory Program where she graduated with distinction in performance. She holds a Doctor of Musical Arts Degree from The Hartt School, a Master of Music Degree from the Peabody Institute of the Johns Hopkins University and a Bachelor of Music Degree from the Baldwin Wallace Conservatory. Her principal teachers include Janet Arms, Emily Skala, Laurie Sokoloff, George Pope, and Jan Angus.